When their sales person felt exasperated trying to get buyers’ attention, this Texas-based coffee brand turned to RangeMe for help. When a friend introduced Ragan Bond to Ethiopian Yirgacheffe coffee in 1996, he was instantly hooked. From there, Bond became a bonafide coffee addict, spending his free time learning about and sampling various roasts and brews. In 2003, Bond was able to realize every coffee lover’s dream when he and his wife, Christi, began roasting their own coffee beans and co-founded Independence Coffee Company. Curious how this women-owned, RangeMe Verified™ brand found success with Hannaford, a subsidiary of Ahold-Delhaize? Grab a cup of joe and read on to hear Bond’s story. Soon after realizing his passion for coffee, Bond moved to Brenham, Texas, a small town with a population of about 17,000. He saw an abandoned building in town one day, and immediately thought to himself, “That would make a great espresso shop.” And thus, Independence Coffee Company was born. Even in such a small town, sales took off thanks to their products were so unique. Since then, the brand has expanded their offering to account for the changing tastes of their customers. “Our new audience is interested in micro-lot and single origin coffees.” Micro-lot coffee is when the best beans in a crop are chosen in order to bring out their unique qualities. Single-origin coffee means that all of the beans were grown in the same geographic region. 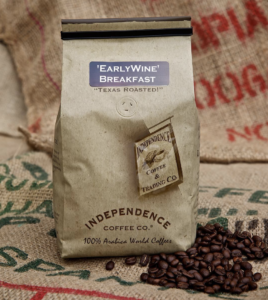 When they first started out, Independence Coffee Co. roasted about 2,000 pounds of coffee per year. Today, the brand has 25 employees, five roasters, and roasts over 650,000 pounds of coffee per year—a huge leap from their humble beginnings. Independence Coffee Co. will also celebrate their 15th anniversary this year on October 3rd. While Independence Coffee Co. found success selling their coffee blends to various retailers as well as bed and breakfasts and corporate offices, the brand decided to sign up for RangeMe to boost their sales strategy. It was also through RangeMe that Bond got involved with ECRM’s category-based sessions. Independence Coffee Co. has participated in the Winter Snack & Dry Grocery EPPS in February 2018, as well as the Summer Snack & Dry Grocery and Beverage EPPS in July 2018. 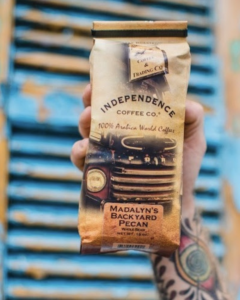 Wherever the coffee market goes next, Independence Coffee Company will be there to roast, grind, and brew up something delicious.